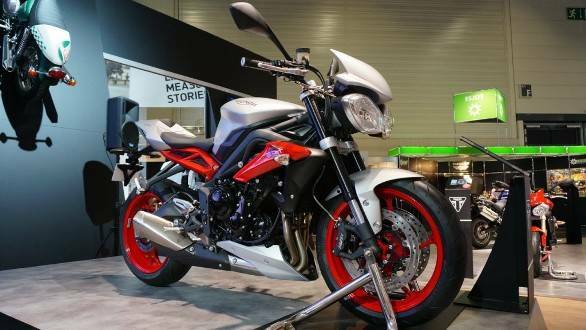 The Triumph Street Triple came out in 2007 and the more recent R model added a couple of critical bits that turned it into a more serious motorcycle. And now, there are more goodies being added to create the new RX model which debuted at the Intermot show in Cologne. The big visual change is clearly the replacement of the old rear-end with the cowl from the Daytona. And it looks good enough for us to imagine that this cowl will probably appear - by factory or by aftermarket - on other Streets, and indeed the Speed Triples as well. Triumph will also add to the RX as standard equipment the accessory engine cowl, rear seat cover and the fly screen. The engine remains untouched with its 105PS 675cc inline triple not gaining the 120PS tune from the Daytona. The chassis actually does have a change - the subframe under the Daytona rear-end is actually from the Daytona. Other changes? There is a standard quickshifter. ABS is standard and the RX gets the same 300mm Nissin brakes as the R.
We expect that eventually Triumph India will add the RX to the Indian line-up because it's easy to do. The question is what the price increment will be - something that will become clearer once the RX goes in sale in many markets in January 2015. If the increment is small enough, Indian customers shouldn't prove shy of paying extra for the additional goodies.